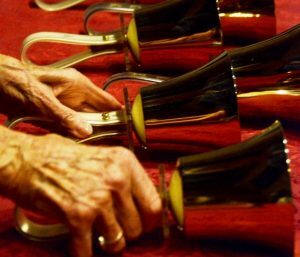 GosBells, St. Stephen’s adult handbell ensemble, rehearses on Wednesday evenings from 6:00-7:00 pm, and provide musical leadership the 9:00 Sunday service approximately once per month between September and May. (There are no GosBells rehearsals during Advent or Lent.) The group is open to any interested ringer of confirmation age and up, and there is no previous ringing experience necessary. A rudimentary familiarity with musical notation is helpful, but not required.